Laura and Jared Schroeder with their sons (from left) Sam, Oliver and Tucker. Dr. Jared Schroeder (’00) and his wife, Laura, met while taking journalism classes at ACU. “I asked her out on our first date while we were standing in [journalism professor] Charlie Marler’s front yard,” Jared recalls. Jared was editor of The Optimist student newspaper. Laura was a student at Hardin-Simmons University in Abilene but taking classes at ACU for a minor in journalism. They met in Marler’s Opinion Writing class and the rest, as they say, is history. 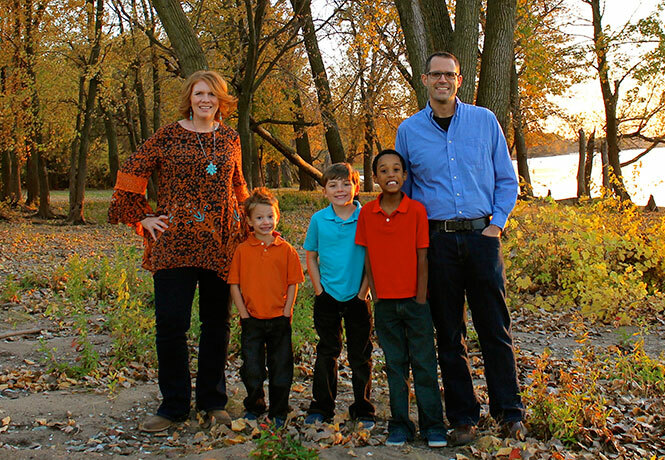 Jared is now an assistant professor of multimedia journalism at Augustana College in Rock Island, Ill. Laura works at the elementary school her boys attend, and is also the clinic coordinator and nutritional consultant at Hope Wellness Center. They have three children: Tucker, 9; Oliver, 7; and Sam, 5. Learn how they chose Tucker as we continue our series on Abilene Christian University alumni who help make a real difference in the world – and enrich their own families – by adopting and fostering children. If you have an adoption story or photos you would like to share with us, please email Robin Saylor, robin.saylor@acu.edu. Tucker has brown skin and no one else in the family does. He’s noticed. It is easy for a 9-year-old to notice differences in skin color, or that most of his friend’s families have the same skin color. It is harder for Laura and me to explain the love and life-changing experiences, for many people, that led to him joining our family. We’ve never hidden from him or his youngest brother, Sam, that they are adopted, or that their birth mothers gave them to us. We show our boys their birth mothers’ pictures and talk with them about their adoptions. Tucker’s not yet old enough to hear about the day in November 2004, in our quiet kitchen in San Angelo, when Laura and I had God reach right into our hearts and begin the process that would lead us to that tiny wad of a baby that was handed to us in the Christian Homes offices in Abilene in fall 2005. Adoptions start with piles of paperwork. As Laura and I began to plow through all of the questions that day, we came to a form that allowed us to determine, by checking boxes, what types of kids we would be willing to accept. Would we accept children from families with certain illness histories? What about birth defects? What about race? These were difficult questions. We started to check the easy boxes first. Then our hearts started to feel heavy. We felt convicted about our picking and choosing. From the beginning, this was a process spurred by faith. God had put adoption on our hearts. Eventually, we found the only answer God would have us give was to check all the boxes. Have faith. When we handed in our paperwork, the social worker kindly explained to us that our choice meant we would almost certainly receive a “hard-to-place” child. The child, she indicated, would almost certainly be of a different race or have a family or health background that would be a concern to some. Not everyone in our families was comfortable with our choices, especially regarding the potential race of the child, which led to an awkward Christmas that year. Later, we would learn that as our families wrestled with our announcement about our intended adoption that Christmas, Tucker was conceived. And as God worked on our families’ hearts the following fall, Tucker was born. By the time he was handed to us, as we met this 7-week-old boy God had very purposefully placed into our hands, our families were there excited to receive him. Tucker has brown skin and no one else in our family does. When he asks about this, we explain to him that that is just the way God wants it. It’s part of a love story that was written for him and for us.